This is Week One of my Weekly Creative Challenge . I was able to create two pieces this week. The first one is called "Vines Within" This piece is a combination of brass, pearls and cloisonne beads. The second piece is a combination of brass and copper wire, beads and original art for me. I've been wanting to learn more about and create with wire wrapping. It's called "Milk and Honey". This is one of the lines I want to work on for 2009 and I'm happy with the outcome so far. Look forward to more pieces in this line. Well it's time for me to get back to work. I will blog soon ! Next Sunday to be Exact!!!!! I'm impressed. Keep it up. I can't believe you did both of those in one week but then again I wouldn't have the patience or talent to do something like that. Congratulations, your work and blog are terrific. You put the rest of us lazy metalsmiths to shame. 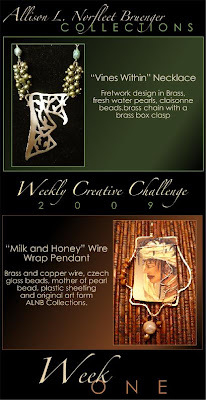 Welcome to the Creative Challenge !